Announcement Key Fobs & Lanyards - KeyFobs make great identification tags for backpacks and sports bags. Make your backpack / bag stand out from all the others! The colorful selection will make finding keys easier and keeps your keys looking stylish too! My selection includes fabric and grosgrain designs on 1.25" heavyweight cotton webbing. Perfect gifts for teachers, coaches, grab bags. Dog Collars/ Leashes - 5 ft fun fabric dog leashes. Take your dog for a walk in style. Golf / Tennis Towels for the golfer and tennis player in your life. I offer custom orders as well as volume pricing, send me a convo. Have fun browsing and shopping on etsy! Key Fobs & Lanyards - KeyFobs make great identification tags for backpacks and sports bags. Make your backpack / bag stand out from all the others! The colorful selection will make finding keys easier and keeps your keys looking stylish too! My selection includes fabric and grosgrain designs on 1.25" heavyweight cotton webbing. Perfect gifts for teachers, coaches, grab bags. Very nice and a great gift for my tennis friends!! Thank you for the little extra too. Very cute! Great quality. Just what I asked for. Get ready for tennis season, team gifts, tournament gifts. All golf towels can be customized with team / player names. Lanyards make great teacher or coworker gifts. Embroidered initial mini key fobs ~ A perfect gift for teachers, new drivers, bridal parties, yourself! A selection of holiday dog collars to dress up your family pup! I’ve been sewing ever since my mom introduced me to a sewing machine. 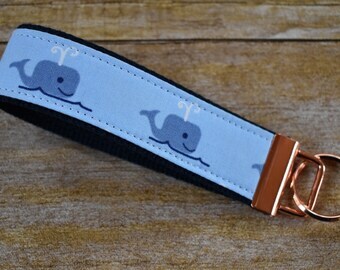 I sew everything from apparel, hostess gifts to keyfobs and lanyards. Key fobs have been a fun project to make as I can customize / embroider them to so many hobbies, sports and careers. I opened my etsy shop in 2011 www.tjjsews.etsy.com that has kept me sewing. I also started selling at Connecticut craft shows, meeting so many great people ~ fellow crafters and customers alike! I have recently added embroidered and vinyl items to my list of products keeping me busy! I love monogramming and personalizing gifts for you and your family and friends. If you have special requests, please contact me at tjjsews [!at] gmail.com. My mother taught me how to sew, I also took Home Ec classes in jr. high school. Along the years I pulled out the sewing machine for random projects. About two years ago I thought "I like sewing, wonder what I can do with it?" and so began TJJSews! Thanks for shopping TJJ Sews on etsy ~ hope you enjoy your etsy shopping trips as much as I do. I want you to be completely satisfied with your purchase. If you feel the need to return, please send me a convo to make arrangements for return. I accept PayPal, Credit Card and eCheck via PayPal payments. If you pay with an eCheck via Paypal, please note that it will delay your order an extra 3-5 days due to the time taken to clear the check. Sales Tax is charged on sales within the state of Connecticut. Sales tax is not charged for any other state. Having an event that you need mulitple key fobs for - I am happy to make a custom / bulk order listing for you. Convo me for pricing. If you need to cancel your order for any reason, please use the Conversation section and contact me as soon as possible. Cancellations will be accepted on all orders if the cancellation is received prior to shipping. If shipping has occurred please see my Refunds Policy. I ship USPS First Class mail 1-2 business days after payment has been received. Most packages will be shipped same day if purchase/payment is received by 2:00 pm EST. I offer combined shipping. I send an email notifying you of shipment. Please make sure your shipping address is correct on etsy as this is the address I will ship to unless otherwise noted by you on your order.